USB flash drives hold everything from personal and medical information to music and pictures and even secure data, with the added advantage of being small and rugged enough for keychain duty.USB Disk Storage Format Tool utility allows you to quickly and thoroughly format virtually any USB flash drive with your choice of FAT, FAT32, exFAT, or NTFS partition types. 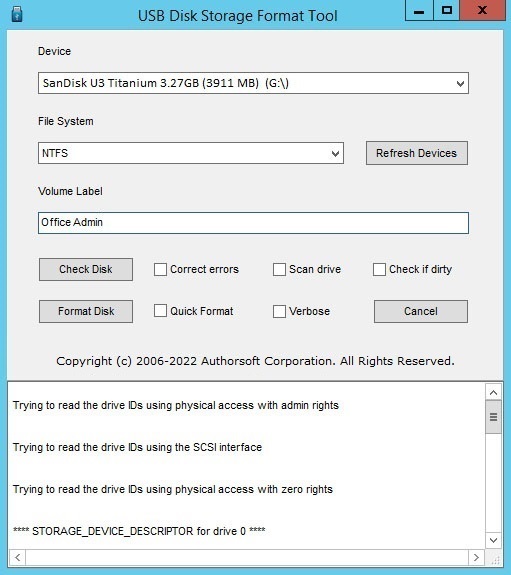 Scan drive for errors before formatting. The software has been tested with thousands of flashdrives (Compact Flash, CF Card II, Memory Stick Duo Pro, SDHC, SDXC, Thumb Drive, Pen Drive) of the following brands, SanDisk, Kingston, Transcend, Corsair, HP, Sony, Lexar, Imation, Toshiba, PNY, ADATA, Verbatim, LaCie, Panda, Seatech, SDKSK9, Silicon Power, IronKey, and HDE. USB Disk Storage Format Tool is the free USB flash drive tool that brings enhanced power and capability to your Windows system at no cost. We recommend the freeware to anyone who uses flash drives. Stellar Phoenix (Solaris - Sparc) is NON-DESTRUCTIVE and READ ONLY file&volume recovery software that helps you in recovering your all-important data. Key File System Data Structures in UFS File system.